I’m currently updating the Bradt guide to Uzbekistan, and while I was there (in October 2018) I drank little but green tea (the beer was awful) and really developed a bit of a habit. I brought some back with me (grown in Sri Lanka!) but it was impossible to keep the habit up – black tea (with milk) is just my default and I seem unable to change that. And I can’t stand coffee. However, I was very happy recently to see the sixth edition of my Bradt Travel Guide to Georgia hot off the press, and also to receive my first batch of tea from a plantation in Georgia that I helped to crowdfund. The Renegades, an unlikely bunch of Balts (five youngsters from Latvia and Estonia) were seized by an urge to revitalise Georgia’s moribund tea industry and have now released their first harvest. 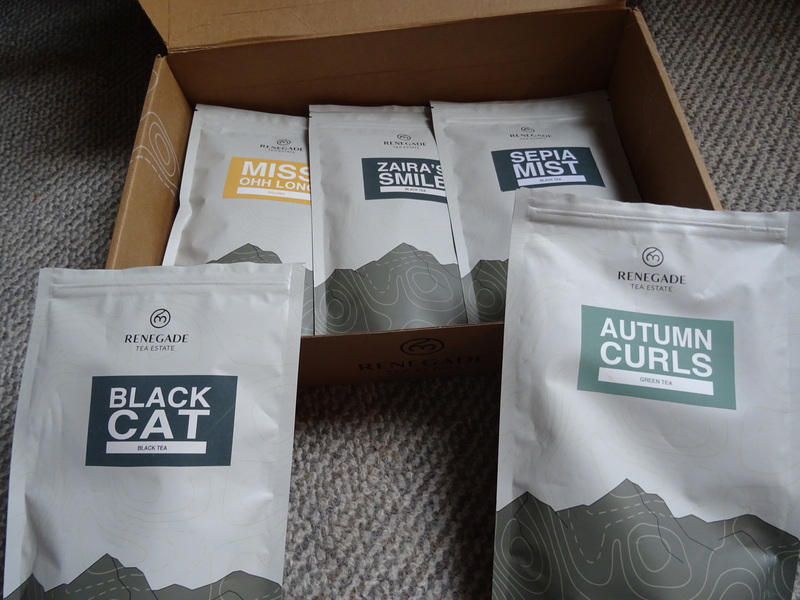 I received a case with six different blends, both green and black, and each packet has far more information thanyou’d get on a standard wine bottle label – eg two leaves and a bud are plucked together, withered for 17 hours, rolled for 45 minutes, oxidised for 25 hours at 35° C, roasted for 25 minutes at 150° C, and finally dried for 20 minutes at 120° C. They also come with brewing suggestions, and are personally signed! It tastes great (I was amazed by how much the leaves swell up in the pot). Having previously gone on a bit about beer and CAMRA, the Campaign for Real Ale, I feel it’s time to join the Campaign for Real Tea. Which doesn’t actually exist, but maybe the Renegade story is the start of a movement, coupled with the recent news that modern teabags are actually a form of single-use plastic, which of course we all hate, just like those throwaway cups. It’s not enough just to encourage people to rediscover the joy of tea, it’s also necessary to do it right. Firstly, no teabags – get a pot and use loose tea! Or a cunning little one-cup strainer like my sister uses. Secondly, make sure the tea meets the water when the latter is actually just off the boil – the moment you cross the Channel from Britain to France or Belgium you’re confronted with waiters serving you a cup of hottish water and a teabag nowhere near the said water, and they are all totally unaware that the coloured water produced when the tea does finally meet the water is definitely not tea. For green tea, I gather that the water has to boil but doesn’t need to be quite as hot as for black tea – some people seem to hold the kettle high above them and pour in the manner of a fancy cocktail mixologist, to let the water cool just that little bit more. Some people think I drink huge quantities of tea, but I don’t, I just drink a couple of bucketfuls twice a day – I seem able to down quite a lot while it’s still warm, while others sit and wait. Strangely, the same thing applies to beer – my first pint goes down pretty quickly, but after that I drink at the same pace as everyone else (well, almost). And I never go to cafés if I can help it and I don’t get on a train and instantly think ‘Must get a tea’ (train travel is far too enjoyable to seek a distraction activity anyway). Rather bizarrely, I happen to have in front of me (no idea how I came by it) a print-out of British Standard 6008:1980, Method for Preparation of a liquor of tea for use in sensory tests – isn’t it great to know that tax revenue has been spent on researching the precise and perfect procedure for making tea? You need 2 grammes of tea per 100ml of water (to an accuracy of +/-2%), and it should brew for six minutes, which is far longer than I ever manage to wait. I could go off and write half a book while waiting. Milk is not essential, but can accentuate differences in flavour and colour, it seems. If desired, it should be poured first, to avoid scalding the milk), which is contrary to what most tea aficionados recommend, and the tea liquor should be at 65 to 80° C (a surprisingly broad range). The milk should be ‘free from any off-flavour’, which also seems a rather unscientific criterion. Incidentally, I recently read that a quarter of the population are ‘thermal tasters’, who experience cold as sour and warm as sweet – I don’t think that applies to me. But I am accused of having an asbestos tongue. I remember when I was writing my guide to Uruguay noting that cancers of the mouth may be linked to drinking very hot maté (the herbal tea that everyone drinks there), but I drink black tea with milk (and I let green tea cool to the same sort of temperature), so I don’t think I’m at risk. I don’t like maté because it’s so bitter (or else it has to be served with so much sugar), which may indicate that I’m not a thermal taster. But for those who do want their beverages at exactly the right temperature some new products are available. The Ember is sold in Apple stores (from £80) and is of course linked to an app on your phone to tell you when to take out your teabag (yuk). 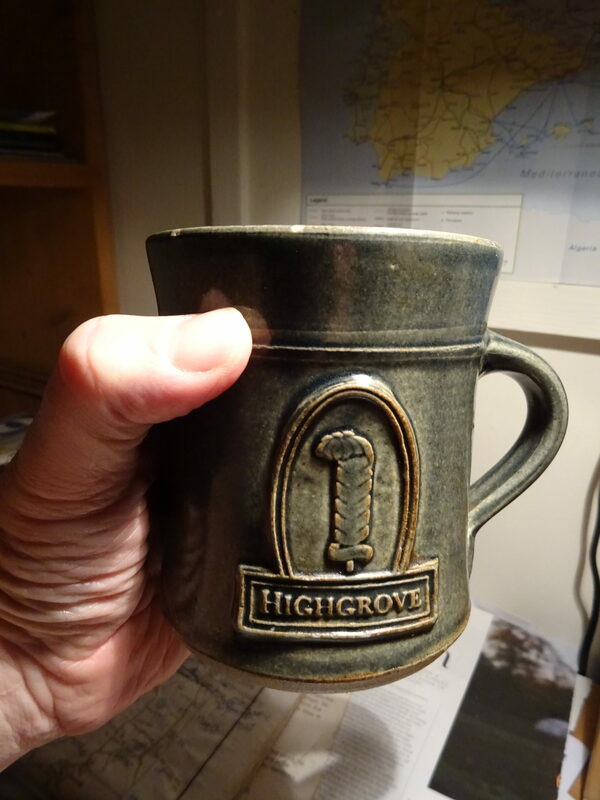 The Glowstone mug is a crowdfunded British venture, so I feel better about it, and it will keep a drink at the correct temperature for an hour – but it costs £129! I really think this may all have gone too far. 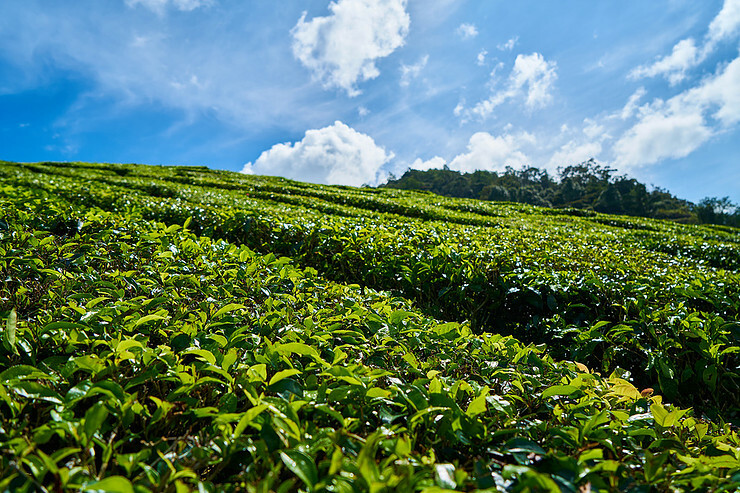 A friend (who will receive CART membership card 0002) recently visited the village of Shree Antu in Ilam, Nepal (just across the border from Darjeeling in India), to stay in community homestays (see this also) and learn all about tea. It sounds great! 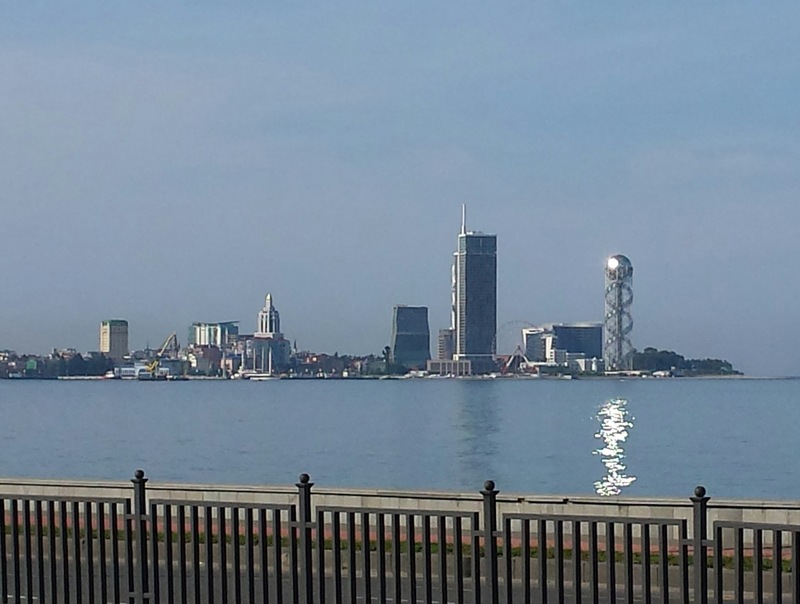 While researching the Uzbekistan book, I also came across this blog and this one by people who are travelling the world and reporting on the tea and coffee they consume along the way. Amazing how focussed people can be in this blogging lark. And now there’s a book too, The Life of Tea: a journey to the World’s Finest Teas by Timothy d’Offay (illustrated by Michael Freeman), published in 2018 – I trust they’ll follow it up with The Life of Pie…. Overtourism, coming soon to Georgia and Uzbekistan? There’s been a lot of talk recently of the problems of ‘overtourism’, with vigorous protests in places like Barcelona and Venice against the hordes who flood in, cause residential accommodation to be converted into Airbnb lets and hostels, get drunk and generally behave disgracefully, forgetting that their destination is somebody’s home, not just a playground. It’s particularly galling in the month that Tourism Concern, the UK charity that has done so much to bring this issue to public awareness, ceased operations (who knows how long their website will remain live?). I supported TC as a member for the best part of twenty years, but membership revenue was never enough to keep it going and in these hard times grants have also dried up. With any luck the issue now has enough traction with journalists and opinion-formers for it to remain in the public eye. Just to recap – since 1995, the number of tourists worldwide has more than doubled, from 550 million to 1.3 billion in 2017, according to the World Bank. International tourist arrivals increased by 7% in 2017 and are expected to continue growing at 4-5% pa. This boom is driven above all by the growth of the global middle class, currently standing at around 3.7 billion, and growing by another 160 million annually (above all in China and India, of course), as well as by the preference of young people now to consume experiences rather than things. It’s fuelled by cheap air travel and cheap cruise holidays, which dump thousands of people at a time in one place, and by social media – there now seems to be a very consumerist attitude to travel, which doesn’t actually happen until it’s been Instagrammed. There’s no doubt that tourism in general is a force for good, in terms of education and international understanding, and in economic terms (it accounts for 10% of world GDP), so no-one wants it to go away altogether, but many destinations are being overwhelmed, while there’s potential to shift some of the load to nearby alternatives. Another game-changer has been the growth of AirBnB, which has created a lucrative new market for itself (gross sales of US$14.4bn in 2016) and for home owners. 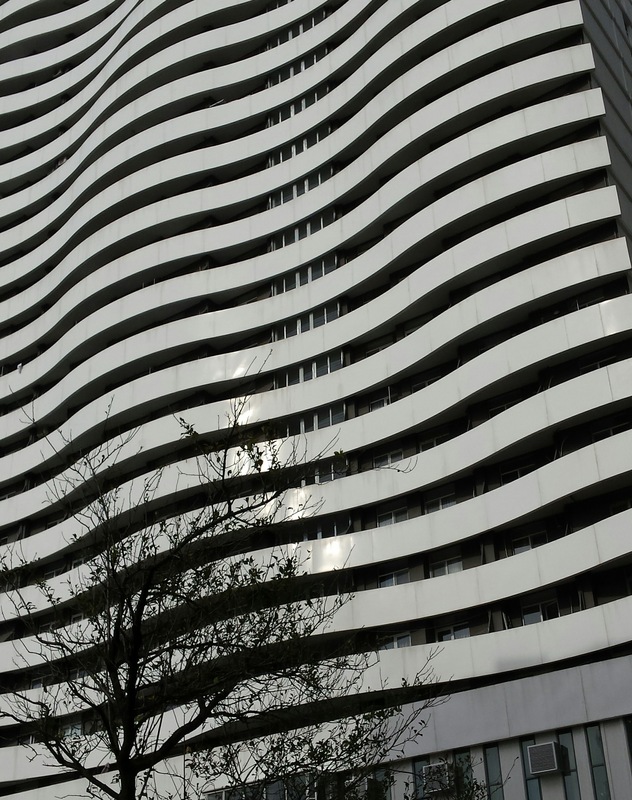 It’s getting a lot of criticism too, for undermining the hotel industry and driving down wages, for disrupting local housing markets and changing the characters of neighbourhoods, and above all for avoiding taxes, and enabling renters to avoid taxes. Little by little, cities across the world are requiring AirBnB properties to be registered so that they can only be rented out for limited periods and taxes can be levied. This has happened in Barcelona, where a new mayor was elected specifically on a platform of cracking down on illegal short-term rentals, in Portugal, where Lisbon and Porto suddenly became Europe’s coolest destinations and property prices rocketed, and in Amsterdam, where the tax on budget hotels, widely seen as swamping the city centre, is also being raised by 20%. Elsewhere, tourist taxes are being increased, as are entry charges – Angkor Wat almost doubled its just before we got there last year – and in Thailand and the Philippines overloaded islands and beaches (including THAT one where they filmed The Beach) are simply being closed. 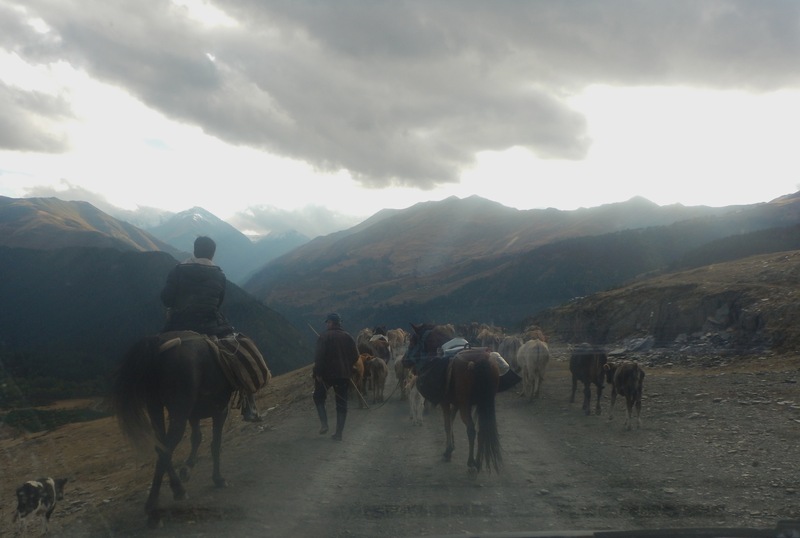 Mustang in Nepal is opening up to tourists but with a fee of US$500 per person. I live in Cambridge (UK), where tourist numbers have grown by two million in just three years, from 5.4 million in 2013 to 7.6 million in 2016 – and there’s a general perception that they mostly get off their buses for an hour or two, clutter up King’s Parade and spend virtually no money. Cambridge is notorious for having almost no hotels anywhere near the centre, so in a way it’s not surprising – but many problems are also being reported with AirBnB properties too. It’s interesting that we are also dealing with a newly identified problem labelled as ‘over-studentification’ – with full-time student numbers in the UK up 660,000 in the last 20 years there is high demand for student HMOs (houses in multiple occupation), which has caused some communities to be virtually obliterated. In response new accommodation blocks have been built and suddenly the areas that had been taken over by HMOs are abandoned. Doesn’t everything move absurdly fast in today’s world? However, I’m now in Uzbekistan, a country that is interested in developing its tourism industry – and with Silk Route cities such as Samarkand, Bukhara and Khiva as key attractions, there’s obviously plenty of potential. To their credit, the government is looking at the rather headlong growth of tourism in Georgia (which of course is covered by my Bradt guidebook and some blog posts), where visitor numbers rose from 2.8 million in 2011 to nearly 7 million in 2017, and the infrastructure has been struggling to keep up – what’s more, there’s a real fear that Tbilisi in particular has lost a little of what made it special, and – more importantly – there’s the beginning of a backlash from residents. I don’t altogether miss the times in the 1990s when there was absolutely no street lighting in the city so that even where there were signs with street names you couldn’t see them, and in any case you had to worry a bit more about being bopped on the head with a steel bar – but still the city is less ‘authentic’ (whatever that means) than when I first knew it. 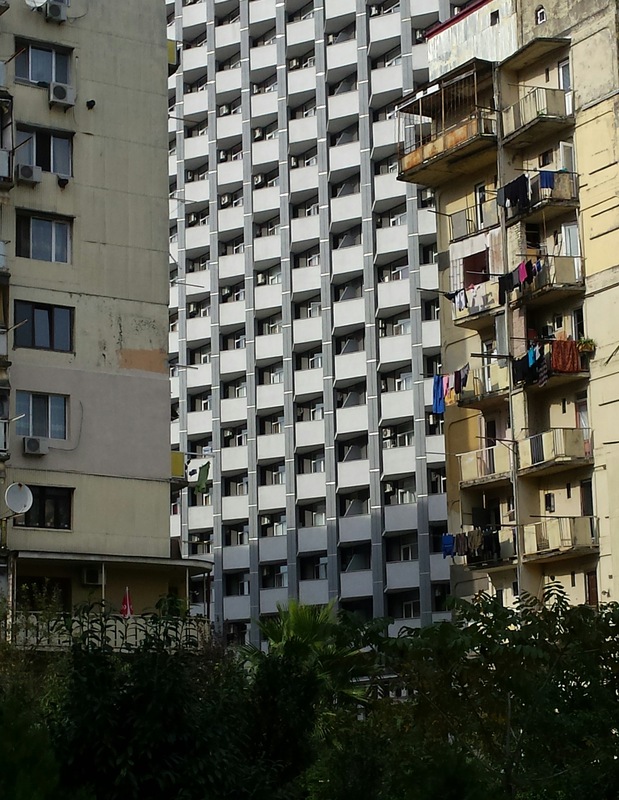 Outside Tbilisi and a few well-known spots, things have changed less. In Uzbekistan there’s pressure to abolish the visa system altogether (as in neighbouring Kyrgyzstan and indeed Georgia and Armenia), but the government seems to be taking it one step at a time, starting with an e-visa system for most of the developed Western countries. Having said that, they did just abolish visas for French tourists a week before the president went on a state visit to France… As I said in my previous post, I’d much rather they abolished the registration system, which is pretty pointless now it’s legal to stay with Uzbeks in their homes, and they don’t bother looking at the registration slips when you leave the country. 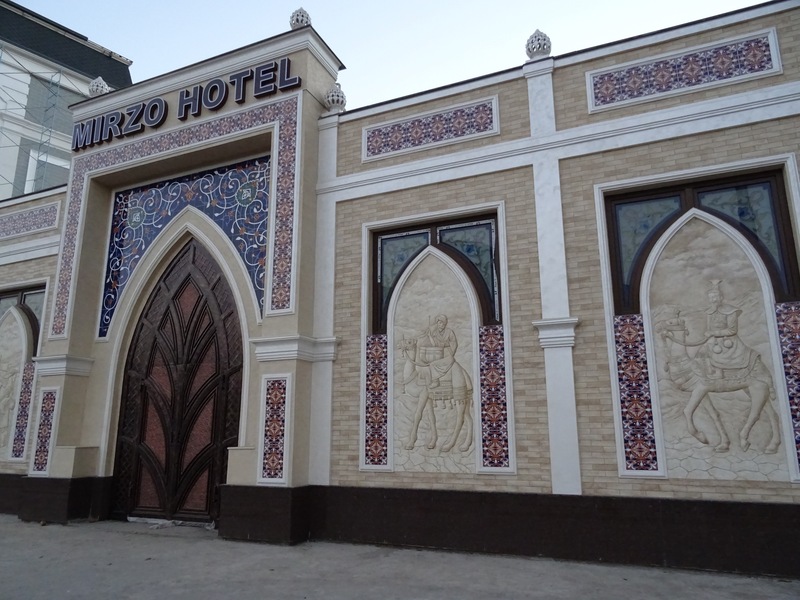 New hotels are being built, and I was very impressed by those in central Bukhara, where modern buildings blend beautifully with their historic settings. In Samarkand they’re being much more gung-ho with their new constructions, alas. The Uzbek railways are seeing a huge amount of investment, with Spanish high-speed trains running from Tashkent to Samarkand, Shakrisabz, Bukhara and perhaps in 2019 to Khiva, as well as a new line to the Fergana region. Booking tickets is still a bit tricky, especially as some of the longer-distance trains don’t run daily, and when they’re full they’re full – there are no tickets for standing passengers. There are more ATMs than a few years ago, although they do tend to be hidden away in hotel lobbies – and this is still very much a cash economy, with little opportunity to let your card take the strain. They very much need to improve internet access, and happily I hear that Korean technology is to be brought in to do that. Nurata – a new park separated by a wall from housing where actual human beings live. There is one rather worrying thing, however, which is that the authorities are rather too keen to demolish their old towns to create park-like promenades to lead tourists from one ancient mausoleum or madrassa to the next – maybe one day these will look natural and lived-in, but at the moment one is just aware of a huge loss of context and authenticity. That said, I’m told that residents are perfectly happy to be transferred to modern housing in the suburbs. 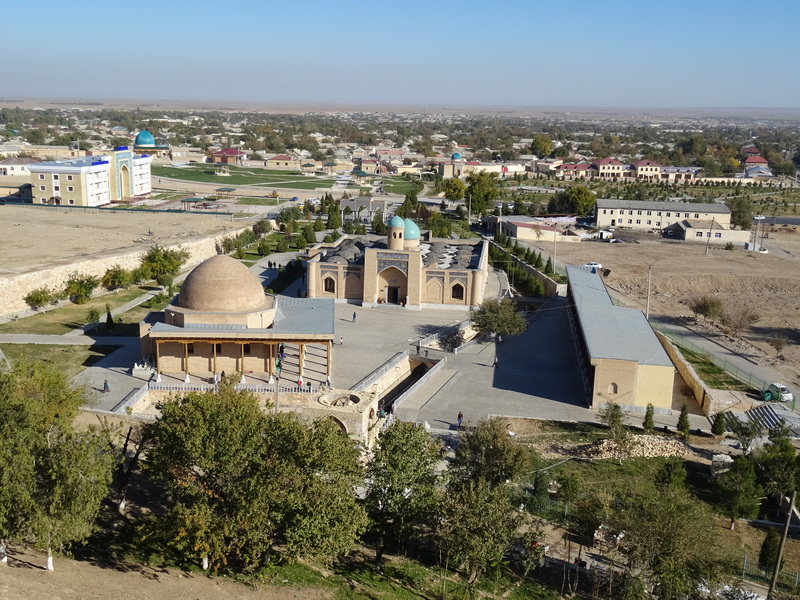 Shakhrisabz is the most notorious example of this (there’s a photo here), but even tiny Nurata now has a rather sterile park between the mosque and a grand new hotel (which it did need). In Samarkand a main road north from the Registan has been nicely pedestrianised, but the neighbouring Jewish quarter was actually walled off (there’s a photo at the end of this post). 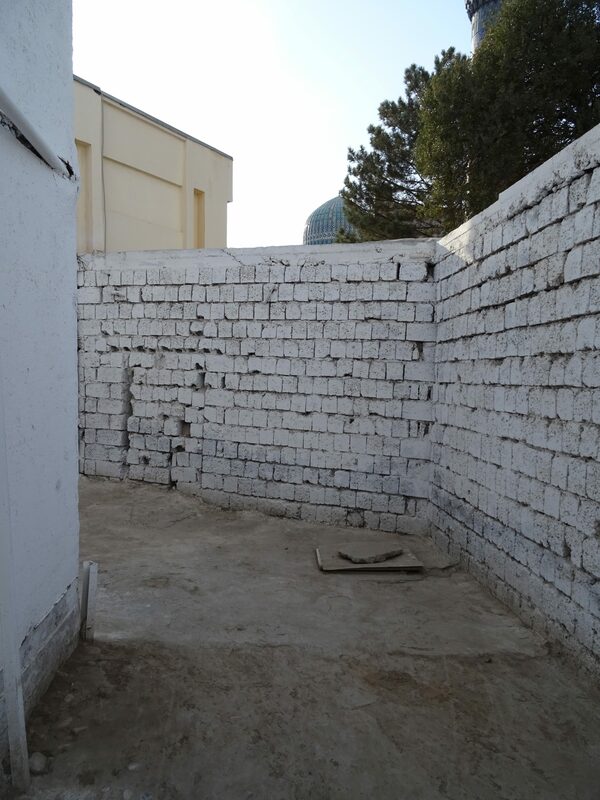 The Gur-i-Amir, the lovely mausoleum of Timur in Samarkand, was left horribly isolated and shorn of its urban context when the surrounding houses were replaced by a park. 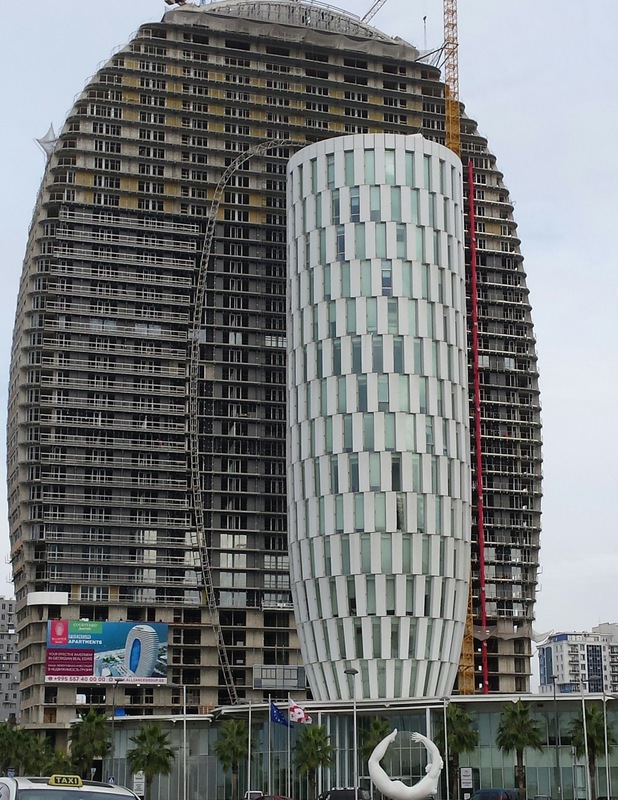 Construction is also under way on Tashkent City and Samarkand City, two glitzy new developments of skyscraper hotels and business centres, and during the presidential visit to France mentioned above, the French company Bouygues was given a contract to build a new hotel complex on the edge of Bukhara. I hope we won’t be looking at Uzbekistan in a few years saying ‘it used to be so great, but now it’s ruined’. There’s a lot to be said for going slowly. 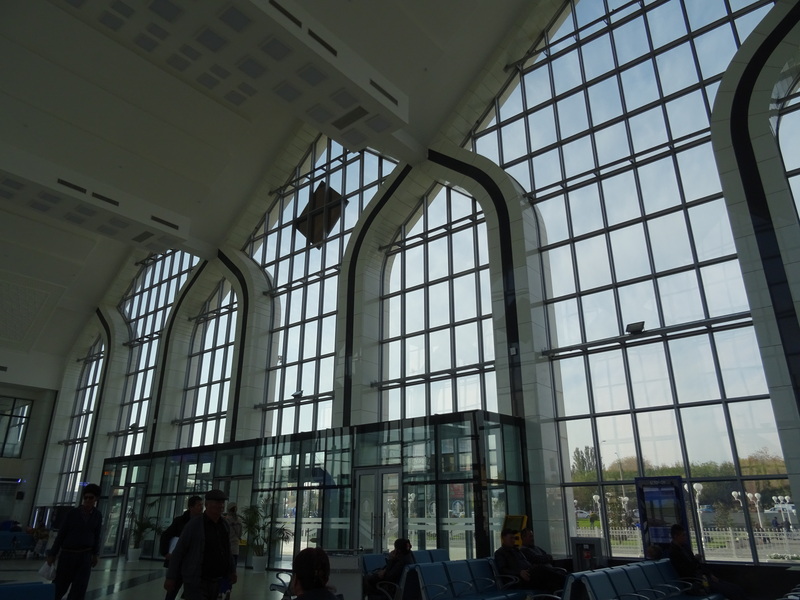 PS the main station in Tashkent is to be refurbished, so they’ve built the new Tashkent Yuzhniy (South) station (below) – international trains still use the main station (which is handier because it’s on the metro) while most domestic trains use the South station. The high-speed Afrosiab trains are currently using the main station but are, I gather, set to switch to the South station. Check your tickets carefully, as nobody bothers to tell you where you need to be, and the trains only call at one even when they pass through the other. 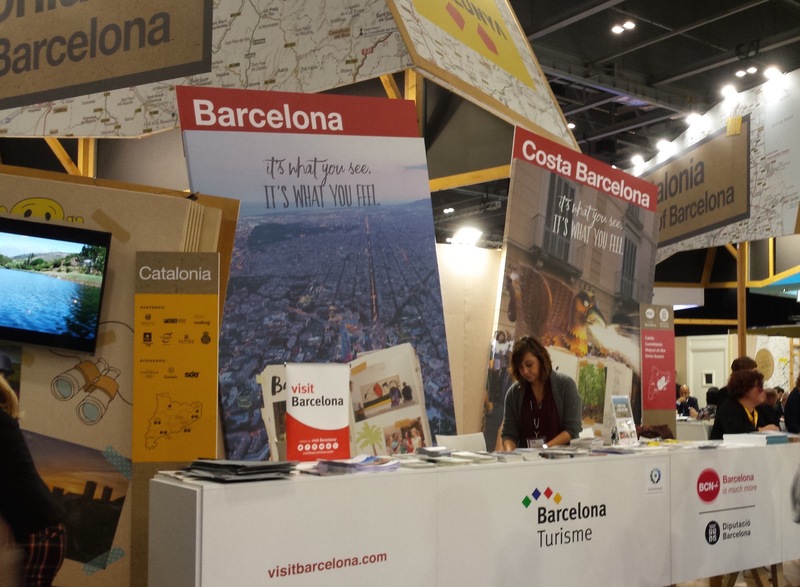 PS Barcelona is still vigorously promoting itself as a destination – this was at the World Travel Market in November 2018. Author adminPosted on November 6, 2018 January 23, 2019 Categories UzbekistanTags e-visas, Georgia, nurata, overstudentification, overtourism, samarkand, shakrisabz, uzbekistan, visas1 Comment on Overtourism, coming soon to Georgia and Uzbekistan? I’ve been in Uzbekistan for a week now, and I can say that while the people and the sights are wonderful, there’s going to be a lot more work than I expected to produce a third edition of the Bradt travel guide. That’s partly because it’s proved very hard to tie up what the maps in the book say and the vérité on the ground, together with lots of changes to street names (and transliteration issues too), but it’s also due to the way that Uzbekistan is changing and opening up, in particular for tourism. Islam Karimov, the strong man who kept hold of power after the Soviet Union broke up, and created a very effective police state, died in September 2016 and was replaced in a very fake election by Shavkat Mirziyoyev, who had been prime minister since 2003. It was assumed that he would maintain the same very tough political system, and that talk of reform shouldn’t be taken too seriously – but once he had retired Rustam Inoyatov, who had been Karimov’s secret police head for 23 years, at the end of January 2018, it has become clear that the reforms are for real. Uzbek society and economy are opening up, human rights activists are returning from exile, and serious efforts are being made to develop tourism, which has obvious potential to be a gold mine, given that the great Silk Route cities of Samarkand, Bukhara and Khiva are all in Uzbekistan. 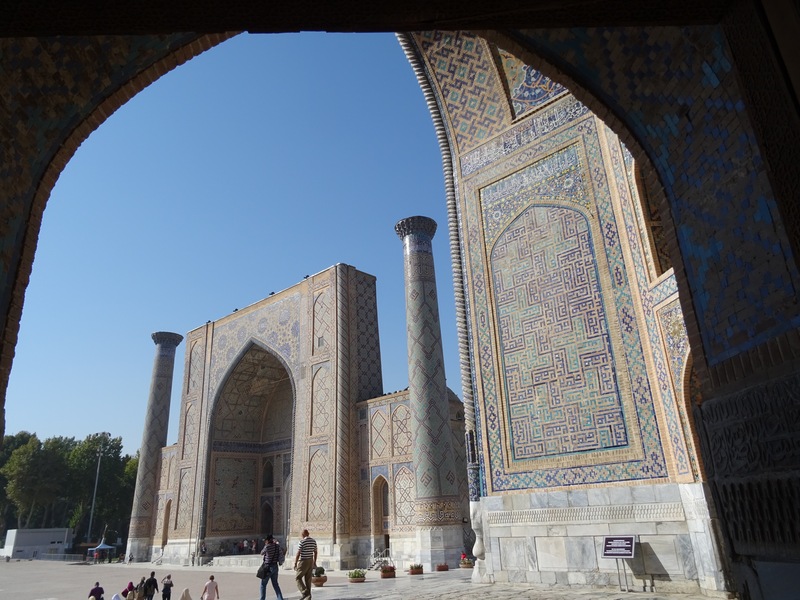 The Registan, Samarkand – everyone wants to come here. It used to be necessary to get a Letter of Invitation from a helpful tour company in order to obtain a visa – this is no longer needed. In July 2018 an e-visa system was introduced (though it’s still rather confusing, in my experience), and citizens of some nations don’t need a visa at all. In September visa-free travel was extended to French citizens, a few days ahead of a visit by Mirziyoyev to Paris. There’s talk of following Georgia and Kyrgysztan in abolishing visas for virtually all countries, but at the moment the official view is that tourism to Georgia has probably developed faster then the infrastructure can cope with (the secret police are perhaps still capable of putting a spanner in the works as well) – as the author of the Bradt Travel Guide to Georgia (six editions now!) and various blog posts, I have a lot of sympathy with that view. One thing they have done is to introduce Spanish high-speed trains from Tashkent to Samarkand, Bukhara and Shakrisabz. In fact what I want is to see them abolish the Soviet system of registration (where the police have to be informed where you’re staying every night, and you have to keep the paper slips to prove it). It’s a damn pain, and when they’re talking of making it easier for people to stay with Uzbek friends and to go hiking and camping, this makes life complicated. It seems that immigration officers don’t check when you leave the country now (I haven’t tested this yet), but hotels use an online system which throws a conniption if there are unexplained gaps in your record. 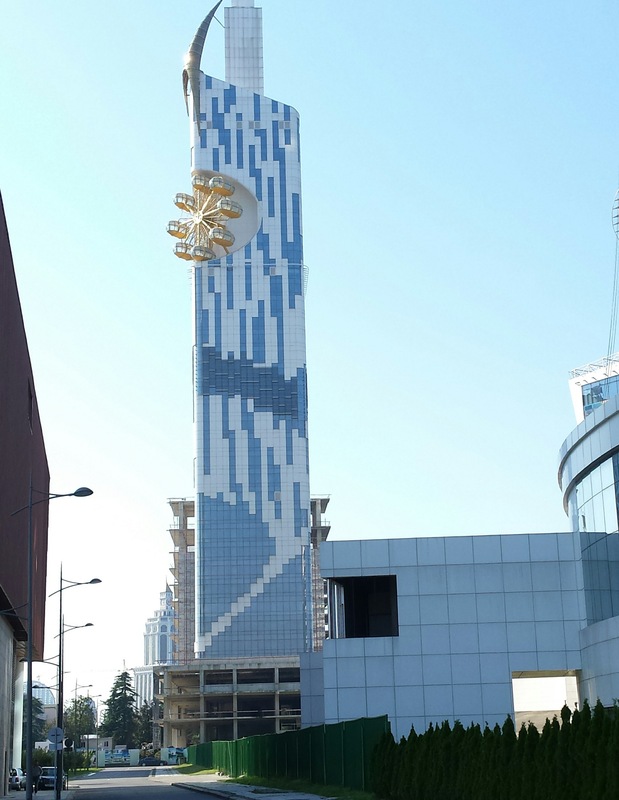 A fancy new hotel in Tashkent, opening in a few weeks. Lots of other things are getting easier – tourists can buy an Uzbek SIM for just a couple of dollars, there still aren’t many ATMs but the number is increasing (they’re mostly in top-end hotels), and the currency has been allowed to float, wiping out the black market, or rather letting everyone change at the true rate (but you do still have to haggle eg for taxis). Online booking, eg for trains and planes, is possible and of course Booking.com and Hostelworld.com have become the obvious way for independent travellers to book accommodation. More and more people, in hotels, hostels, restaurants and elsewhere speak English and German. 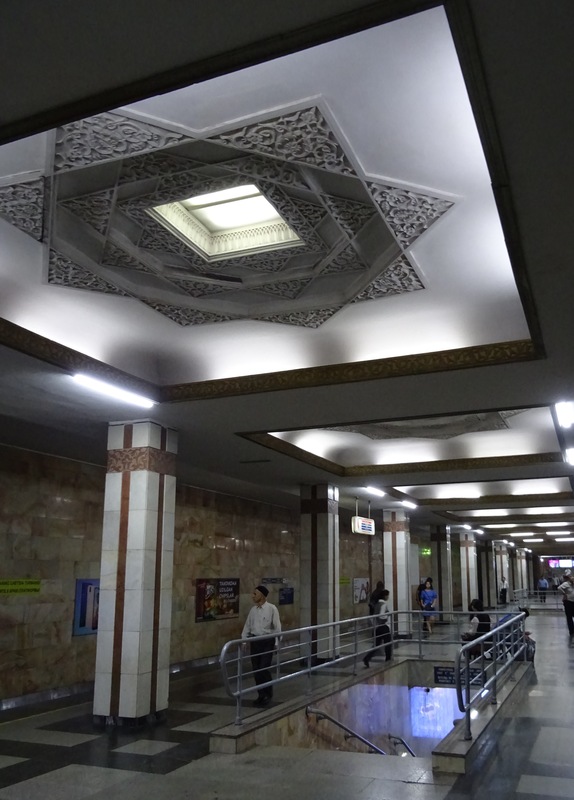 The number of places where you can’t take photos is far smaller than it was, and in particular you can take photos in Tashkent’s gorgeous Metro. In fact there used to be passport checks to enter the metro – there are still plenty of police with metal-detector wands there, but they never bother tourists, and hardly anyone else, as far as I can see. Museum tickets used to be very cheap, with a swingeing extra charge to use a camera, but now the tickets costs slightly more – still just two or three dollars – and photography is included. I’ve noticed in the last five years or so that the world’s art galleries have accepted that everyone has a phone now and have stopped preventing photography except for special exhibitions and specific loans. 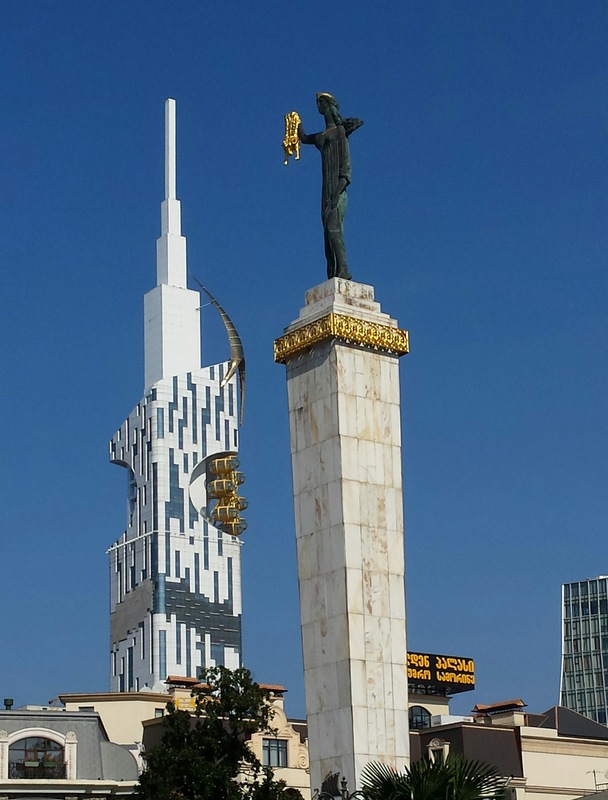 On the down side (but this began in Soviet times), there’s been some rather over-enthusiastic restoration of historical monuments, while others are still in a tumbledown state. New pedestrian boulevards have been smashed through old towns to link tourist sights (the three Ms – mosques, madrassas and mausoleums), and it’s particularly shocking that some of the remaining old quarters have been walled off so the tourists can’t accidentally get lost. This is particularly so when it’s the old Jewish quarter that has been walled off. 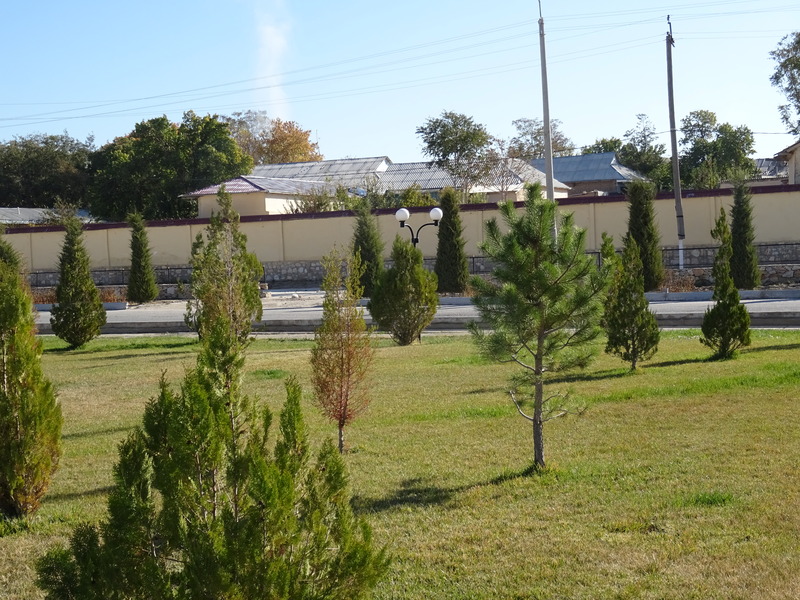 Amazing – a wall between Samarkand’s Jewish quarter and the tourist area. This is just to let you know that the sixth edition of my Bradt Travel Guide to Georgia is published today – I’m very happy with it, I was able to add all the new material I wanted and generally bring the book up to date (the previous edition felt just a little twentieth century – in a Georgian context – when I used it in the field). The editorial process went remarkably smoothly – I assumed that the fact that tourism was increasing by no less than 20% a year meant that sales of the 5th edition were also up by 20% and that Bradt were happy to cover the cost of extra pages – in fact they used thinner paper which doesn’t look great, but it’s not too awful. The most annoying thing, in fact, was using booking.com, with the meaningless slogan ‘We speak your language!’ and the constant repetition that the most basic guesthouses have a 24-hour front desk and luggage can be left there, not to mention ‘Couples particularly like the location — they rated it 9.7 for a two-person trip’ – all made-up nonsense. 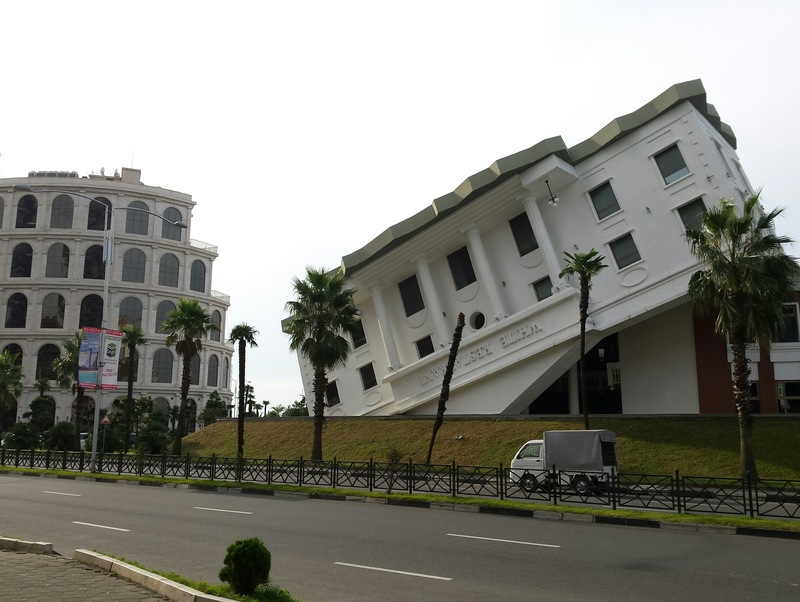 As for recent news – in November 2017 a fire at the Leogrand Hotel and Casino in Batumi (not listed in the book) killed eleven people and shone a powerful light on the downside of the free-for-all policies behind the city’s tourism boom, hinted at on p.286 of the book. It’s obvious that safety standards were ignored by both businesses and local government, and I hope that has changed now! 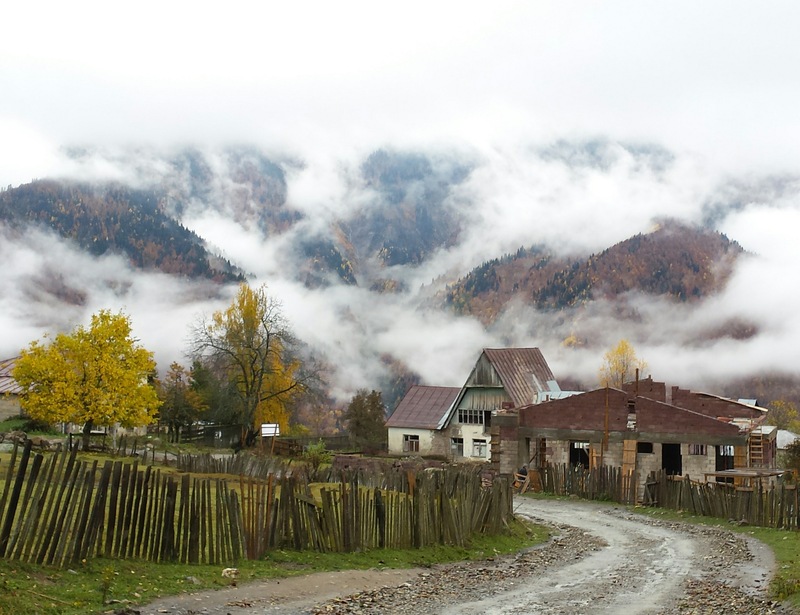 There are serious proposals from the government to build roads into the mountains of the High Caucasus, past Juta and (via a tunnel) into Tusheti, which everyone who knows anything about sustainable tourism is totally opposed to – on the surface, of course, better access is good for residents trying to get to hospital or the shops, but it will destroy the tranquility of this beautiful area which is becoming more and more popular for long-distance hiking and horse-riding. It reminds me of the sad decline of the Annapurna Circuit, which was one of the world’s great hikes but has now been largely replaced by roads – there’s far more of a population in the Nepali mountains, so there’s more need for roads there, but the Georgian mountains are much emptier. Finally, having written in the new edition about the liberalisation of social attitudes in Tbilisi, led in particular by nightclubs such as Bassiani (p.124), it’s sad to see that there’s recently been a backlash against these changes, with police raids and public marches. This is also in part a backlash against the increasing numbers of foreigners living in and visiting Tbilisi, which fits into wider narratives about over-tourism and populism. I hope this will calm down quickly, as tourism and western influences have generally brought positive change in Tbilisi. PS at the moment I’m reading The Towers of Trebizond by Rose Macaulay (a bit dated in style, but still a classic), which is set in the part of Turkey right by the border with Georgia – which she refers to throughout as Russia. Grrrrr! PPS As of today, 22 June 2018, Georgia has a new prime minister, after Giorgi Kvirikashvili was pushed to resign due to disagreements with Bidzina Ivanishvili – there had been protests in Tbilisi for a couple of weeks about a poor investigation into a schoolyard fight that left two sixteen-year-olds dead, along with the death of a Pankisi man in an anti-terror raid, both in December 2017. The new man is Mamuka Bakhtadze, who was in charge of Georgian Railways and then Minister of Finance; born in 1982, he’s apparently a friend of Ivanishvili’s son and had been groomed for high office. However the norm is for Ivanishvili’s picks to lose favour and be removed from politics within a couple of years. Tbilisi is a lovely, fascinating city, with its mix of cultures, cuisines and architecture, but it is also horribly congested and polluted, due above all to its population’s addiction to cheap and filthy second-hand cars, imported from Europe and Japan (many of them are right-hand-drive, which given the urgency of every Georgian driver’s need to overtake is also very dangerous). I wrote an open letter to the mayor in the pages of Georgia Today on my last visit, three years ago, and the city’s problems have only got worse since then. So I’ve written a new one (below). Georgia held local elections on Saturday (21 October 2017), for mayors and councils, and Tbilisi elected a new mayor (the old one went off to be ambassador to Germany). The new mayor is Kakha Kaladze, who was captain of Georgia’s soccer team for many years and a key player for AC Milan. Since retiring he has been a leading figure in the Georgian Dream coalition, which was set up with the specific aim of removing the barnstorming and increasingly authoritarian president Mikheil Saakashvili from power. 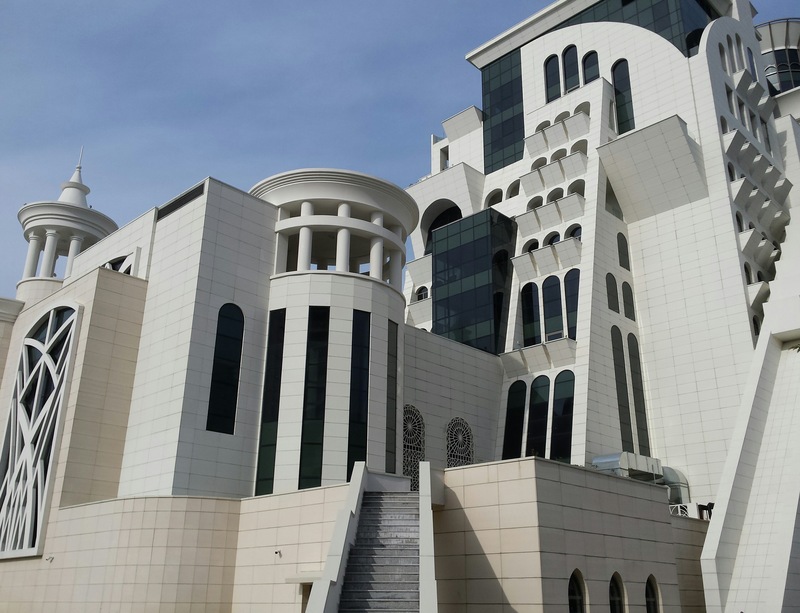 It was led and funded by the billionaire Bidzina Ivanishvili, who was prime minister for a year before handing over the office but keeping the power behind the scenes. It’s a strange situation for a country to be in. Kaladze impressed as deputy prime minister and energy minister, I’m told, working hard to master an unfamiliar brief, until resigning in July 2017 to campaign for mayor. I keep hearing the same old complaint here that ‘our politicians are all useless, they never do anything for us’ – and it’s true, they’re not producing any of Saakashvili’s grandstanding projects, but it’s quite wrong to say that the government is doing nothing – in a month of travelling around the country I’ve seen roads being built and paved, railway tunnels being excavated, gas supplies being brought to more villages, and museums and theatres closed for major refurbishments. Of course, what people really want is a massive boost to the economy and some serious job creation – and tourism is booming, with guesthouses and hotels bursting at the seams this summer and many more being built. In foreign policy, the government has managed to keep a balance between looking west and not annoying Russia. So what more do people want from their government? I was fascinated to see that the Czechs have also this week elected the billionaire oligarch Andrej Babis to lead their government. Is this all part of the same rebellious phenomenon which led to Brexit and Trump? But in fact the Georgian Dream, having comprehensively outspent the other parties, managed to win just over 50% of the vote in most cities, conveniently avoiding the need for run-off elections. Dear Mayor Kaladze, congratulations on your election and the best of luck in your new job. Now it’s time to get to work! 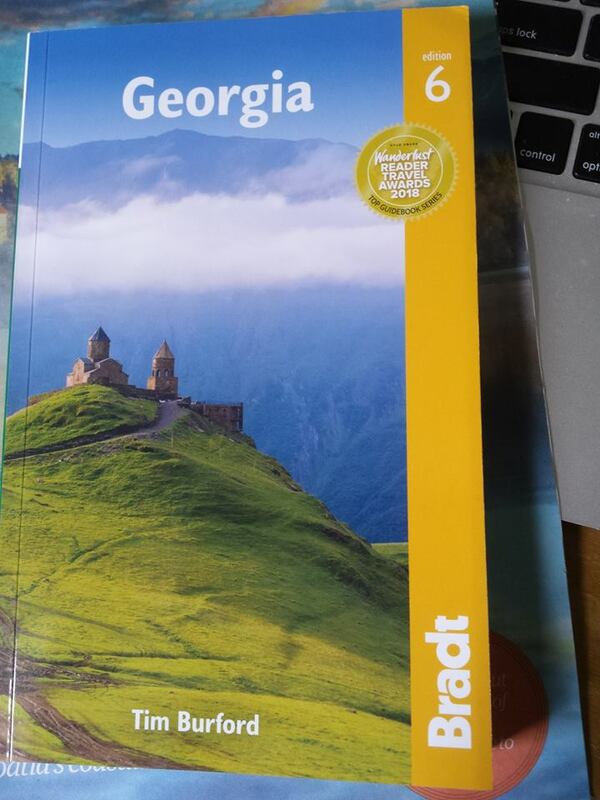 I am the author of the Bradt Travel Guide to Georgia and I am currently in Georgia researching the 6th edition of this book. Three years ago I wrote your predecessor, Davit Narmania, an open letter in this newspaper pointing out various problems with Tbilisi’s streets and its transport system and suggesting some ways to tackle them. Very little has been done since then, and the fundamental problem, the addiction of the Tbiliselebis to their cars, has clearly got worse. There are various reasons for this, but one is that there is absolutely no real enforcement of parking restrictions and other traffic laws – people leave their vehicles wherever they want, on footways, in the middle of roadworks, blocking disabled access points. This is illegal, and in June 2016 your predecessor promised to clear the pavements/sidewalks of parked cars by September of that year – you’ll have noticed that this did not happen. It is simply a matter of enforcement – we know that the Georgian police can be reformed more or less overnight, and they have recently managed to crack down effectively on drinking and driving. I think it’s time to do it again – instead of driving around with loudhailers telling stopped drivers to move on, they should enforce laws against using phones while driving, not wearing seatbelts (sitting on the lapbelt does not count), red-light jumping and speeding – and above all ticket, clamp or tow cars that are parked on the footways and sidewalks. The points-based driving licence is a good start, but only if the police actually take an interest in these offences. And while you’re at it, tell them not to drive around with their emergency lights flashing – otherwise what have you got when it’s a real emergency? As in so many cases, Georgia needs to look at basic standard practice in the countries to the west. Somewhere like, oh, maybe Milano. The problem, of course, is not just traffic congestion, the fact that it takes so long to get anywhere and then there’s nowhere to park when you get there, it’s also that it’s almost impossible to cycle in Tbilisi or to go out in a wheelchair, and it’s also the fact that the city’s air is foul and dangerous. Georgia has become a repository for Europe’s crappiest worn-out cars – half of the cars in Tbilisi are apparently over 20 years old, and every day another 170 cars enter Georgia, 130 of which are over ten years old. Naturally these are filthy – and as I’m sure you know, an International Energy Agency study identified Georgia as having the world’s highest mortality rate due to air pollution (household and outdoor) in 2012. I was astonished to hear that air pollution is checked at just three sites in Tbilisi, and not 24 hours a day (and that the government roadworthiness test was actually voluntary for over ten years). At least the government is finally acting to restrict the imports of right-hand-drive cars, which are obviously accidents waiting to happen. barriers for the years that the Galleria has been under construction! It’s very easy to oblige contractors to install signs and barriers. Again, look at standard practice to the west. In July 2017 your predecessor produced a Green City Action Plan, aiming to control congestion and construction, to improve bus services (including continuing to replace the old yellow buses with blue ones fuelled by compressed natural gas, as well as introducing bus lanes and bus-priority traffic lights), and to produce a cycling strategy. I live in Cambridge, where over a quarter of the population cycles to work, and this is not unusual across Western Europe. Obviously the kilometre-long cycle track on Pekini Avenue has attracted some derision, with people asking how on earth they’re meant to get to it, but do please stick with it! Yes, a cycling strategy has to be about getting people from door to door, on safe roads throughout, but it’s also important to have some visible headline projects to spread the message. But why is there no indication whether cycling is permitted in the contraflow bus lane on Davit Agmashenebelis? 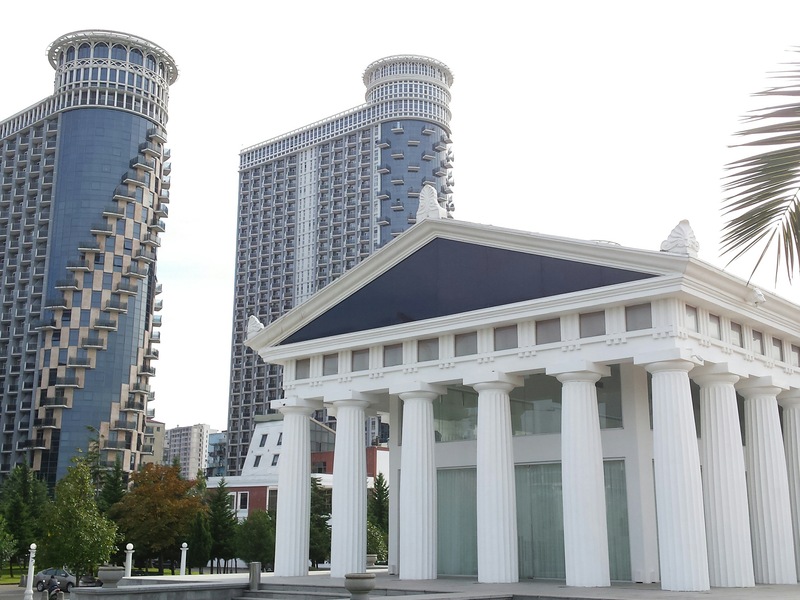 Why is there no cycle route through Rikhe Park, or behind the Public Service Hall – and indeed why can’t we have a riverside route the whole length of the city? Having double three-lane highways on either side of the Mtkvari just feeds the city’s car addiction. But the first and simplest thing to do is to install cycle parking across the city (but especially at schools and universities) – and proper Sheffield Stands, please, not those thin things we see in a few places now that don’t actually support a bike. In my letter of three years ago, I asked why so many buses terminated at Baratashvilis Street – couldn’t they be linked up to allow longer more useful journeys that people are currently using cars for? Likewise for the routes terminating at Orbeliani Square – link them up! Keep them moving! But alas, I see nothing has changed – I was at Ortachala the other day, wanting to go to Chugureti – but every single bus was going to Baratashvilis Street. Luckily I was able to change on the embankment to route 31, going to Station Square. And where did it go? To Baratashvilis Street! 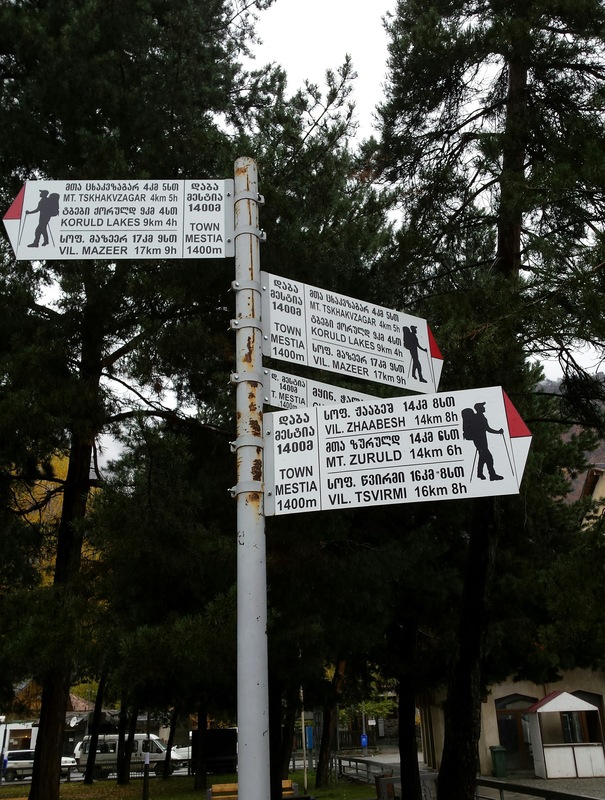 And then the whole length of Rustaveli, and not to the Marjanishvilis Bridge but all the way to the Circus and Tamar Mepe – so I had quite a walk back to where I wanted to be. I know the ticket inspectors like to do all their checks at Baratashvilis St, but that’s really no reason for all the buses to go there. At least the airport bus (route 37) is now operated by the bigger new blue buses, a huge help to all the people just trying to get from Rustaveli to Avlabari without waiting at Baratashvilis St. Speaking of the airport, the train is utterly pointless at the moment (I was the only passenger going all the way when I tried it out) – to be any use it has to run hourly (calling at Samgori and Didube for metro and marshrutka connections) to say Gori. 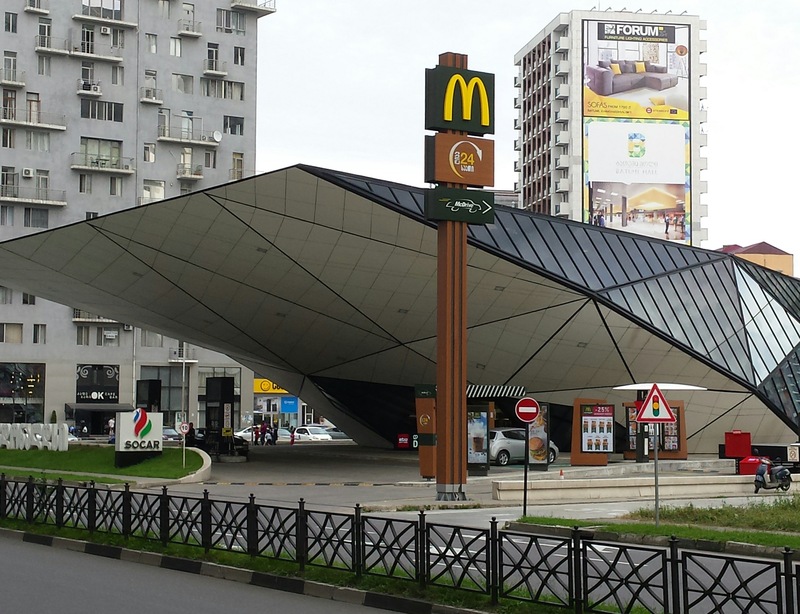 If you were really ambitious you could look for a Park-and-Ride site near Mtskheta. I also mentioned Galaction Tabidze as an example of how NOT to do pedestrianisation – the recently pedestrianised east end of Davit Agmashenebelis is a far better piece of work, so could you please now go back to Tabidze and fix it? And I haven’t even mentioned rubbish and recycling! You have lots to do, Mayor Kaladze – good luck! Train; bus; plane; bus; metro; marshrutka (minibus); taxi; four-wheel-drive – and after about 27 hours travel and almost no sleep I made it to Tusheti, the remotest part of Georgia, across the watershed of the High Caucasus near Daghestan and Azerbaijan. 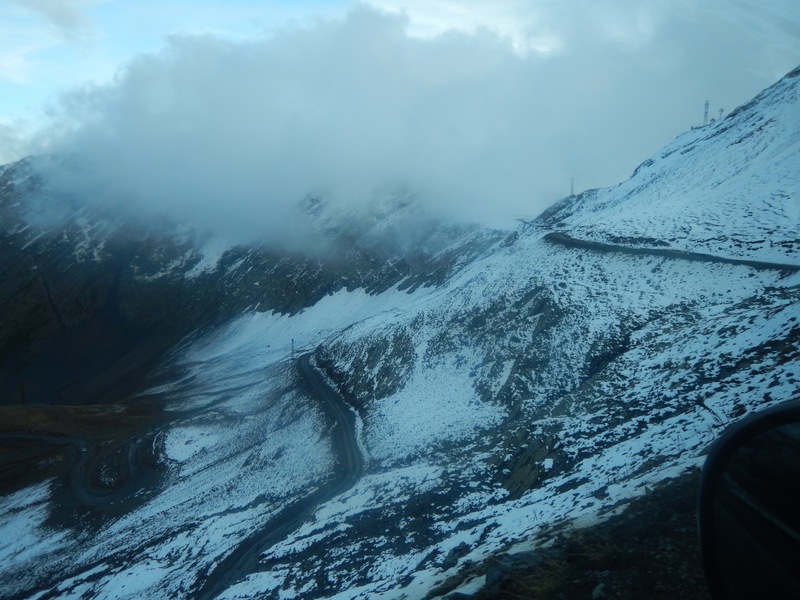 It can only be reached by a four-wheel-drive-only track across a virtually 3,000-metre-high pass that is closed by snow from mid-October to May. I’m here to research a sixth edition of my Bradt Travel Guide to Georgia, and it’s only because I’m huddled in my chilly room without wifi and with just one dim energy-saving light bulb (powered by solar panels that clearly aren’t seeing enough sunlight) that I’m writing this. Georgia’s other two mountain areas are far more accessible – Kazbegi (or Stepantsminda) on the Georgian Military Highway, the road to Russia, and Svaneti with a road that was totally rebuilt in 2011, cutting the driving time from Zugdidi to Mestia from 6 hours to under 3 – and both are getting pretty busy. 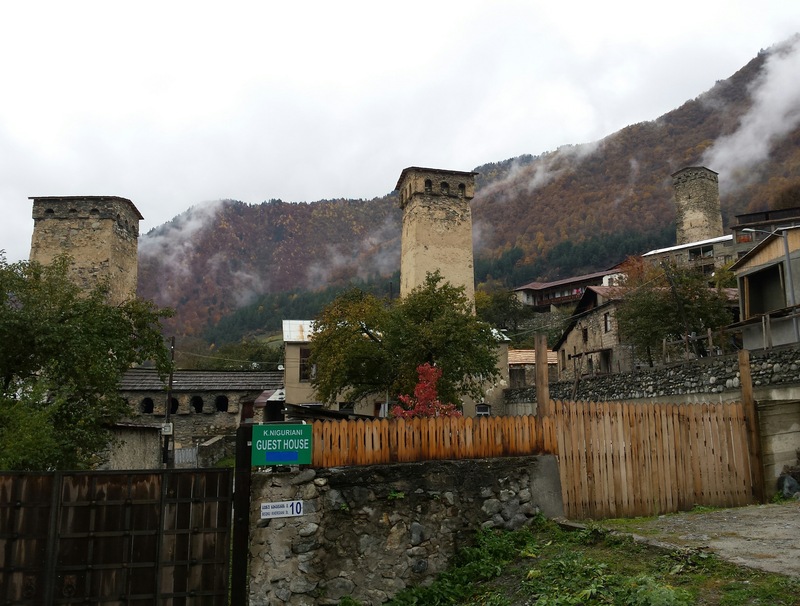 Svaneti in particular is easily reached from Kutaisi airport, Georgia’s booming low-cost airline hub, and is attracting considerable numbers of hikers seeking some seriously tough back-country adventure. There are also many new guesthouses in the main town, Mestia, and in other villages, which are busy with tourists seeking a less strenuous, more cultural, experience. 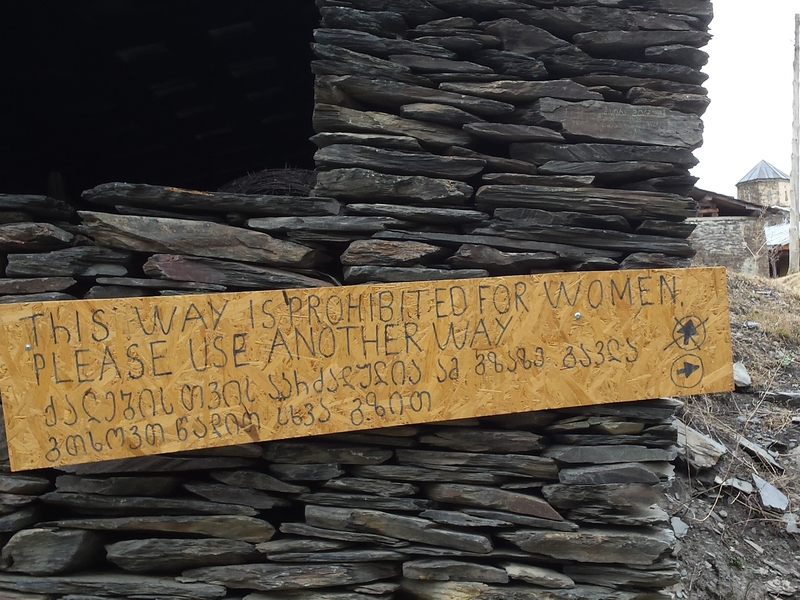 Tusheti, however, remains remote and mysterious, and will do so as long as the road remains so rough (no, you can’t fly in, short of chartering a helicopter – while Mestia does have an airport). But now I hear of plans to drive a tunnel through the mountains from Pankisi (which until recently had the reputation of being a hideout for Chechen guerrillas and jihadists, because it has a small Muslim population, although most are peaceful Sufis). 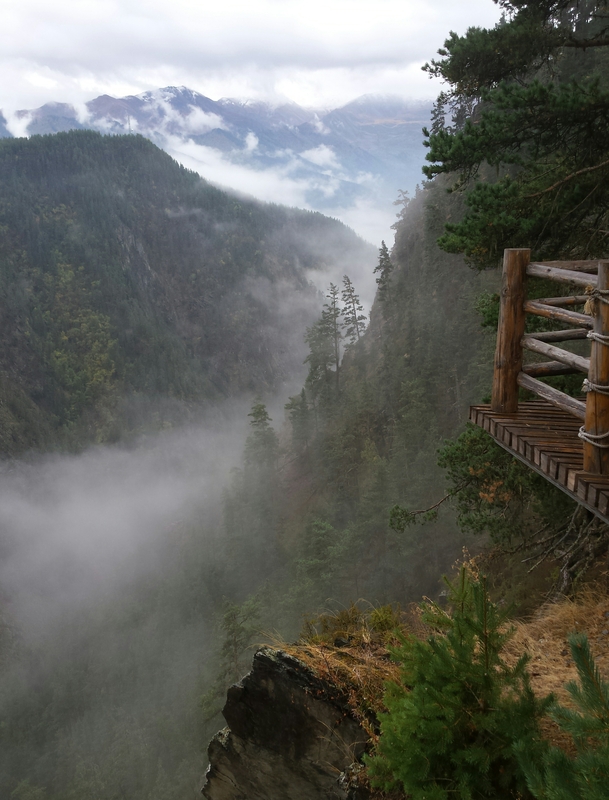 If this were ever to happen, it would be a disaster for Tusheti – it would be flooded with tourists, many just on day trips, yet large hotels would be built, and the virgin pine forests would doubtless be plundered. They hope for World Bank funding for the tunnel – if there’s any sign of that, I will be leading the campaign to block it. 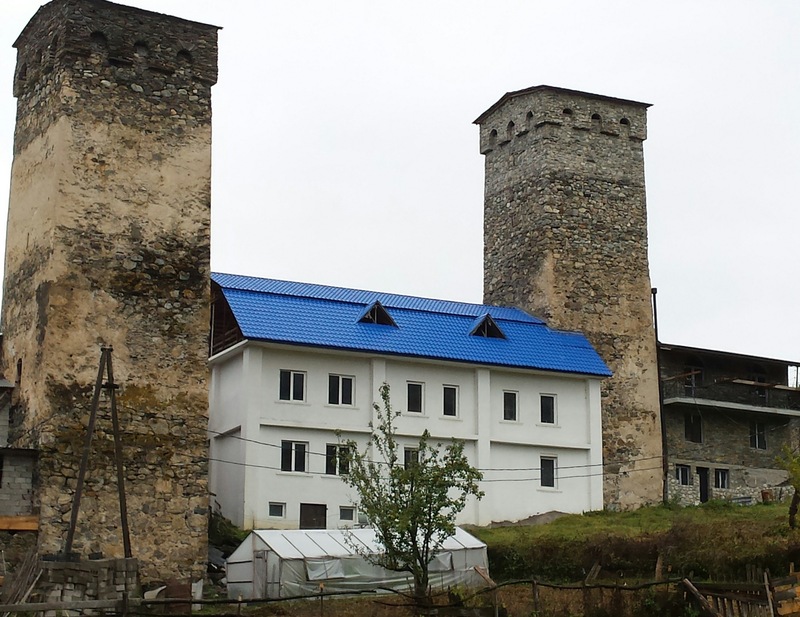 When I first went to Svaneti at the end of the 1990s it had a well-earned reputation for lawlessness and banditry, and only a few carefully guided tourists ever went there – the idea that we would now be wanting to protect other areas from Svaneti-style over-touristification would have been utterly laughable. But here we are. 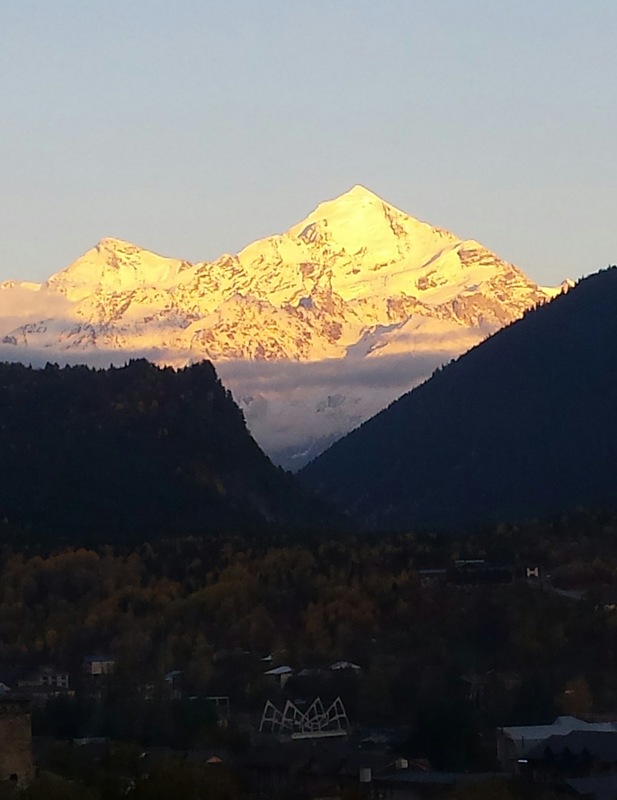 Anyway, it’s bright and cold and very beautiful here – there’s snow already at the end of September and more is falling on the pass. The guesthouse owners are closing up two weeks earlier than usual, nailing up tarpaulins over their balconies and all other openings, and heading down to their winter homes in Kvemo Alvani (where they also grow all the vegetables that are brought up to Tusheti in summer). 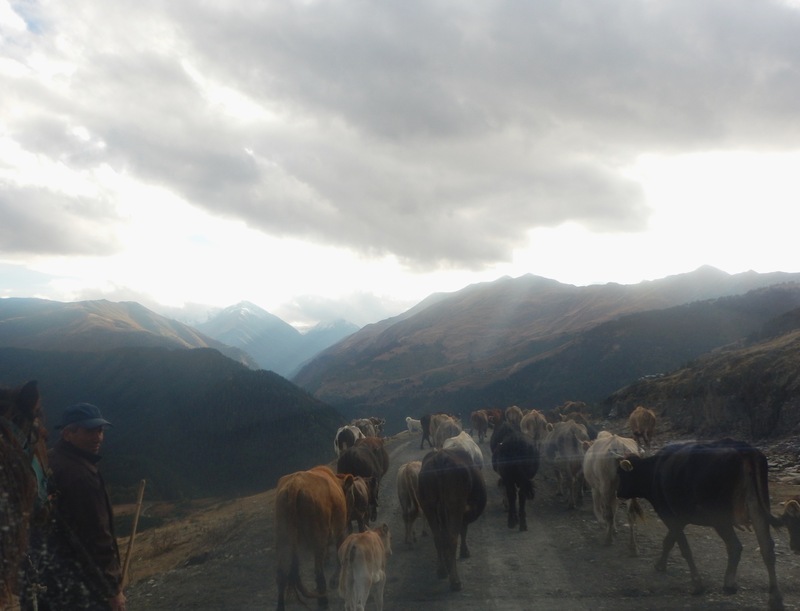 Many of them can drive down, but all the cows, horses and sheep have to walk over the pass and down, one of the last great transhumances that used to be common in mountain areas around the world but have now almost vanished. 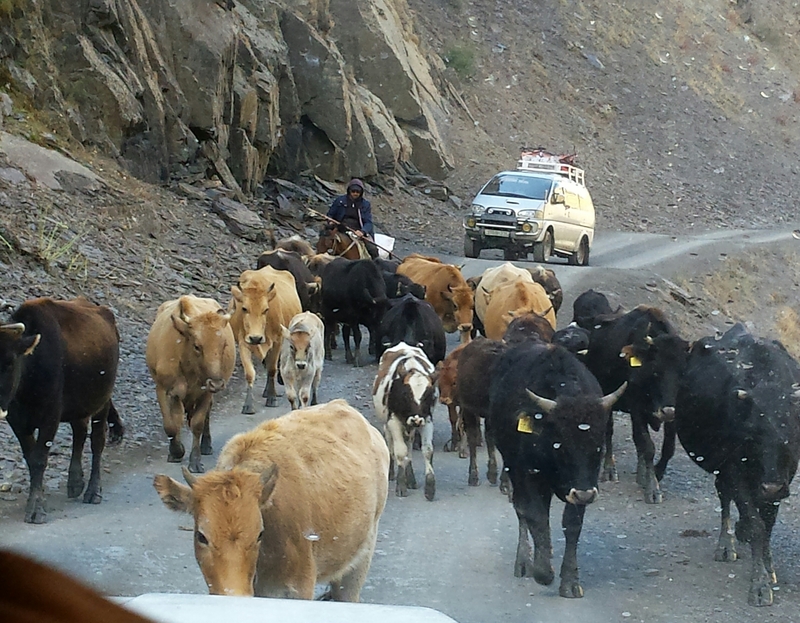 They follow the 4WD road, with vehicles forcing their way through, and are still on the move in the dark at 8pm with a couple of herders on foot, while others on horses go ahead and build fires at improvised campsites. 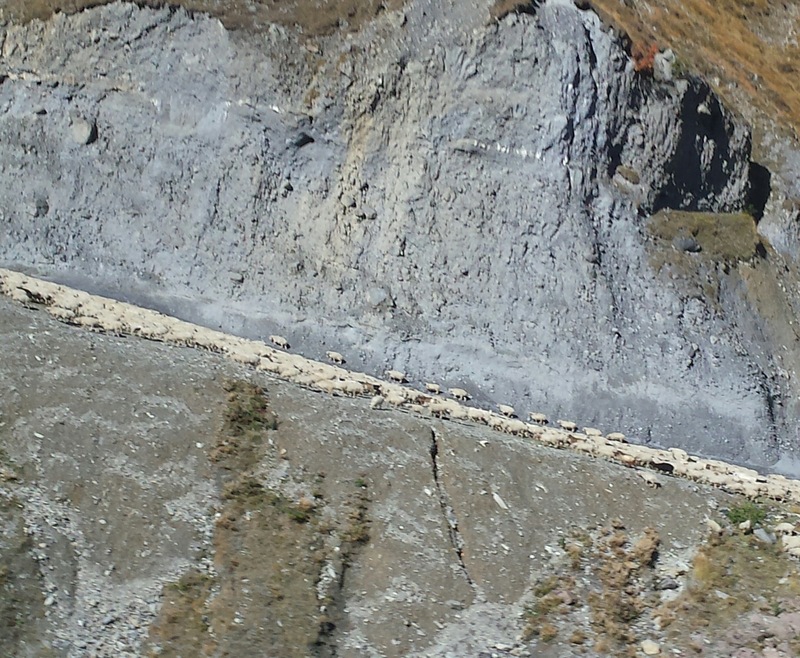 Sheep leave first, at the end of September, with the cows and horses following; it takes them three days from Omalo in Tusheti to Kvemo Alvani, where they stay until November. Then they walk on to the Vashlovani area near the border of Azerbaijan, taking a week, and return to Kvemo Alvani at the end of April. Again the sheep leave first for Tusheti, at the end of May (as soon as it’s possible to hike over the pass), and the cows and horses follow soon after – there’s a great video on YouTube of horses sliding down on their haunches on the snowy slope from the pass. It was a great privilege to see this, and if anyone wants to travel with the herders I can put them in touch with someone who can arrange it. 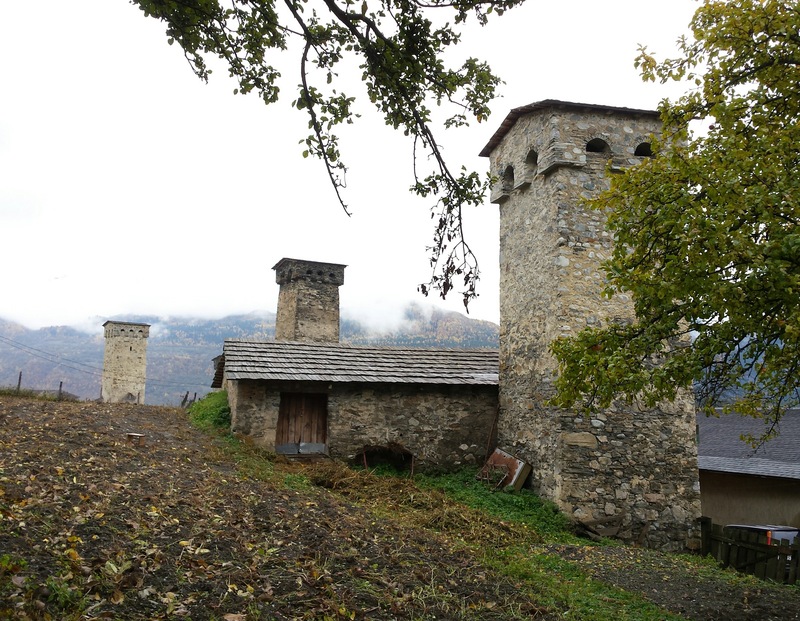 PS I have just seen that a cheese-maker from Tusheti has won first prize at Slow Food’s cheese festival in Italy – which provides an interesting link to my previous post on Parma and Italian food! 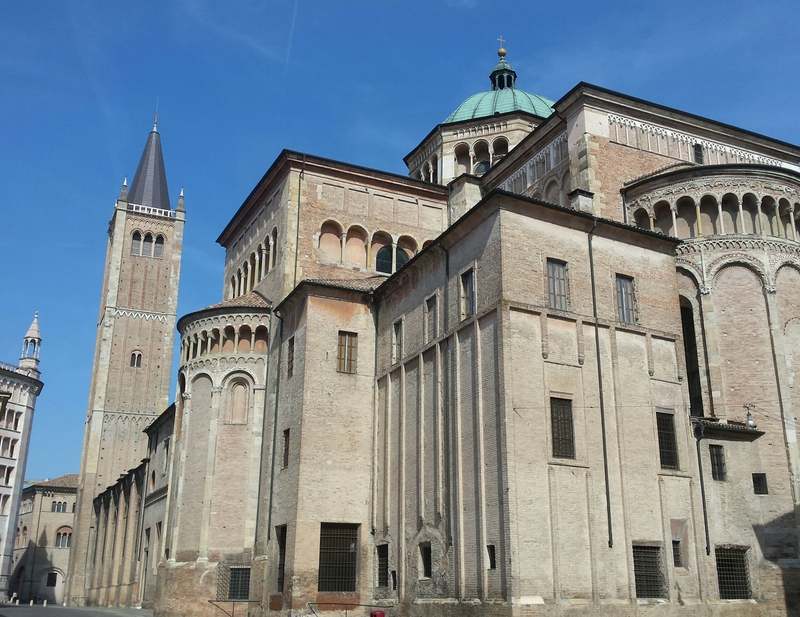 Parma is a temple to Italy’s three great loves, food, music and art, and they like to cycle too (even the recent African immigrants, unlike elsewhere in Italy), so what’s not to like? And any town that has a bookshop that’s been open since 1829 (Libreria Fiaccadori, Via al Duomo 8 – open seven days a week, and to midnight from June to August!) is my kind of town. Starting with food, the Slow Food movement (now prominent worldwide) may have started in Bra, in Piedmont (and been triggered by the opening of a McDonald’s in Rome in 1986), but nowadays Parma has a fair claim to be the epicentre of the movement towards sustainable production of traditional local food and drink, thanks above all to the global fame of its ham and cheese, and the measures put in place to protect them from competition, above all from the rapacious and unscrupulous global agroindustry. I speak, of course, of prosciutto crudo di Parma (Parma ham) and Parmigiano Reggiano (Parmesan cheese). I won’t go into details, but in order to gain the EU’s Denominazione d’Origine Protetta (Designation of Protected Origin), producers have to follow a very specific process for sourcing and processing these foodstuffs, and can then command a premium price for them. Parma has also been designated a UNESCO City of Gastronomy. A similar concept to Slow Food is Cucina Povera or Poor Cooking – not just peasant cooking (which is usually great, worldwide, except perhaps in North Korea) but a specific adaptation to the poverty of peasants in Italy in the late nineteenth century (the time of the great migration to the USA. of course) and after the two world wars – people learnt to cook with the cheapest ingredients, such as potatoes, beans and lentils, with any meat used coming from offcuts. This has now become fashionable as a way to cut excess, to get back to a simple traditional lifestyle, and simply as a healthier option. Anyway, the best Parma ham comes from the hills to the south of the city, especially the Langhirano valley, where there are around 500 authorised producers (and a ham museum in Langhirano village), and also to the north along the River Po, where the ultra-lean culatello ham is produced. Parmesan cheese is produced on the plains north of the city, and there’s also been a large tomato-processing industry in the area since the nineteenth century. Some local dishes include tortelli d’erbetta (ravioli stuffed with ricotta cheese, nutmeg and spinach), tortellini filled with pumpkin and savoury cheese and served with a butter sauce, and torta fritta, fried dough pillows served with thin slices of Parma ham. Some dishes come with an appropriate amount of shaved Parmesan on top – do not wantonly smother your food with grated Parrmesan, that’s as dumb as drowning it in ketchup. And putting Parmesan on pizza is a crime against gastronomy. Speaking of pizza, it’s acceptable to have a beer (just one) with pizza, but otherwise you should drink wine with Italian food. Quite right too. Lambrusco is one of the local wines, and nothing like what you imagine – it’s still spritzy (but many Italian table wines actually have a bit of fizz to them, surprisingly) but the dry and semi-dry (secco and semisecco) styles go really well with local food. It’s easy to visit producers, especially with the TastyBus Foodseeing tour or similar. I’ll say more about Italian food (and beer) below. As for music, Parma’s main claim to fame is that Guiseppe Verdi was born nearby, and there’s an annual festival of his music in the city – but the lyric soprano Renata Tebaldi was also born nearby and studied at Parma’s conservatoire. There was a Tebaldi exhibition in the castle of Torrechiara in Langhirano, but this was replaced in 2014 by a new museum dedicated to her at the Villa Pallavicino in Busseto. The great tenor Luciano Pavarotti and the soprano Mirella Freni were both born in Modena, just down the road. And finally (and rather lengthily) art – the Galleria Nazionale has a great collection, including a simply perfect representation of ideal beauty by Leonardo da Vinci – there’s much less Flemish and Dutch art here then in Genova and Torino, and more Gothic and Renaissance Italian art. It’s housed in the huge red-brick Palazzo della Pilota, which was remodelled internally between the 1970s and 1990s by the local architect Guido Canali – you enter through the remarkably large Teatro Farnese, built in 1619 and rebuilt in 1956 after damage in World War II, then a funky metal walkway leads backstage and across to the gallery. The earlier old masters include Daddi and Gaddi, Veneziano, Spinello Aretino and Fra Angelico (his lovely Madonna of Humility) and Giovanni di Paolo, Bici di Lorenzo and Neri de Bici; there’s an Annunciation by someone close to Botticelli, and nice pieces by Jacopo Loschi, the leading Parmesan painter of the second half of the fifteenth century, straddling the Late Gothic and the early Renaissance. After La Scapiliata, Leonardo’s lovely head of a young girl, I found that the rooms beyond in the north wing were closed except for a group visit at 5pm – I don’t know if this is a permanent arrangement. Until then, I went out past some portraits of the later Bourbon rulers of Parma to a fine Neoclassical hall (1825, with Canova’s statue of Maria Luigia of Austria (Duchess of Parma 1816-47) and a massive muscular second-century Hercules found in 1724 on the Palatine Hill in Rome) and then the galleries created by Maria Luigia to display the works of Correggio (c.1489-1534), the leading painter of the Parma School, though these are too sentimental for my taste. There’s also work by Parmigianino (Girolamo Francesco Maria Mazzola, 1503-40), the leading early Mannerist painter (and one of the first etchers), who was as his nickname implies born in Parma. You’ll also see Agostino Carracci (brother of the better-known Anibale), who died in Parma in 1602. Returning at 5pm, the lower part of the northwest wing houses less important fifteenth- and sixteenth-century artists from Parma and the Po area, such as Alessandro Araldi, Cristoforo Caselli, Filippo Mazzola (father of Parmigianino), Dosso Dossi and the rather twee Il Garofalo from Ferrara. Upstairs, there are works by Michelangelo Anselmi (1491-1554), who was born in Lucca only because his father was exiled from Parma, and was living here by 1520. Slightly surprisingly, there’s also a portrait of Erasmus by the studio of Holbein. 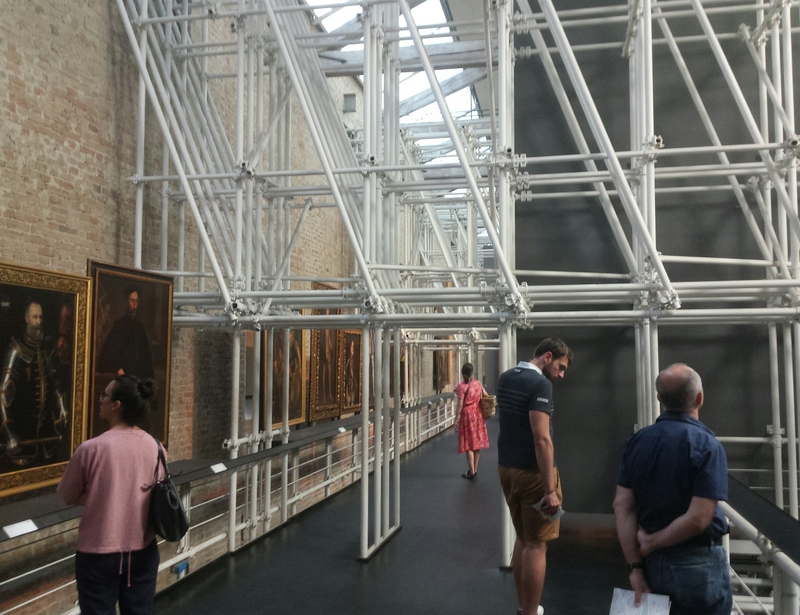 Another metal walkway leads up to a former hayloft, now a great space for displaying larger paintings – there are portraits of the ruling Farnese family by Girolamo Mazzola Bedoli (c.1500-69), a Mannerist who was born and lived in Parma, marrying Parmigianino’s cousin, as well as works by Annibale Carracci (the better-known one – a small self-portrait and a big Dead Christ), Frans Pourbus the Older, Tintoretto, Palma Il Giovane, Agostino Carracci and Lambert Sustris – there must be a law that every gallery in northern Italy has exactly one work by this Venice-based Dutch painter. Don’t miss the small but very striking El Greco of Christ Healing the Blind (1573-6). Other local artists include Giovanni Battista Tinti (1558-1604) and Giovanni Lanfranco (1582-1647), who moved to Rome and adopted the new Baroque style. Going down and back, there’s work by Guercino, various seventeenth-century portraits including some from the studio of van Dyck, then the usual slew of dull eighteenth-century paintings before reaching Tiepolo, Bellotto (four definitely by him plus two attributed) and Canaletto, with various views of Parma (from the 1860s) and prints from 1557 on as you head for the exit. Parma’s second-best gallery is the Pinacoteca Stuard, in a wing of the tenth-century Benedictine nunnery of San Paolo, which has a less locally-focussed collection including works by Niccolo di Tommaso, Bicci di Lorenzo, Giovanni di Francesco (formerly attributed to Uccello), Van Eyck, a follower of Lippi, Parmigianino and Domenichino, and upstairs Lanfranco, Valerio Castello (from Genova) and a follower of Guercino. On the other side of the nunnery, you can visit the abbess’s rooms, decorated by Correggio et al in 1519 then shut up and forgotten from 1524 to 1774 – there’s a copy of the Last Supper by Alessandro Araldi, then after the chapterhouse (with good carved stalls), a room with the vault painted by Araldi and then the highlight, the Camera di San Paolo, where Correggio decorated the vault of the abbess’s private dining room to simulate a pergola with vivacious mythological frescoes that are considered one of the masterpieces of Renaissance art. The pagan subject matter seems out of place in a nunnery, but San Paolo’s convent was known for good living and lax rules. While there, it’s also worth popping into the Castello dei Burratini, a free museum of puppetry with a good video of a puppet playing the piano and puppeteers working and singing too. In 1530-4 Correggio also painted the cupola of the duomo (cathedral), which was consecrated in about 1106, with a Gothic campanile added in 1284-94 and side chapels in the fifteenth and sixteenth centuries. The apse was painted by Bedoli, as well as the vaults of the choir and the nave (c.1557). The interior is totally covered with frescoes, some very Mannerist in style; there are some older ones in side chapels such as the Capella del Comune. Alongside the duomo is the amazing Baptistery, a highlight of the transition from Romanesque to early Gothic architecture. It was built in 1196-1216 and decorated then with sculptures by Benedetto Antelanni and his workshop – the seemingly random sculptures in niches all around the base of the Baptistery is known as the Zooforo (or zoophorus), a series of 75 panels of symbolic and fantastical subjects. The highlight is its umbrella vault, frescoed in the 1220s with sixteen segments radiating from the keystone and six concentric horizontal bands, depicting scenes from the life of Abraham; the life of John the Baptist; Christ in Glory with the Virgin and the Baptist, prophets and kings; the Apostles and Evangelists; the celestial Jerusalem; and heaven with a red bullseye at the top representing the Empyrean. Your ticket includes the Diocesan Museum, which is small but decent enough (with information in Italian only) – you’ll go down to the foundations of some third-century Roman walls and then see Roman coins and ceramics from the cathedral area, then carvings from the first churches, fairly simple mosaics – and thankfully no vestments, which are what I always expect to see in diocesan museums! There’s more Correggio in the church of St John the Evangelist behind the duomo, where the cupola frescoes were painted by the man himself in 1520-24 and the nave frieze by his studio, while the Bono chapel (the fifth on the right) houses two Correggio canvases; the nave vault was painted by Anselmi (1521-3). The chancel is very Baroque, and the façade was added in 1607 and the 75m-high campanile in 1613. Finally, Pamigianino was commissioned to paint the frescoes of the cupola of Santa Maria della Steccata, built in 1521-39 – he only finished the Three Wise and Three Foolish Virgins (1526-7), high in front of the altar, which show remarkable skill in modelling. When I travel in France or Switzerland I’m used to waking up a couple of times in the night to drink water, due to what is for me (who basically doesn’t use salt) over-salted cooking. In Italy I wake up five or six times a night, the food really is that salty. I do always claim that Italian food, especially in the south, is the world’s best food for vegetarians, but in the dark of the night it can seem like hard work. Of course, Italians also like bitter coffee (cappuccino is famously served only in the mornings, after that you have to take it strong and bitter) – happily there is an alternative, as Italy serves up the world’s best hot chocolates, some so thick you could almost stand a spoon up in the cup. (Forget about tea, they don’t have a clue.) They also have a thing about after-dinner digestivos, also known as amaro (‘bitter’), just to make the point clear. Thankfully, there are some pleasantly light and sparkling pre-dinner drinks – the cocktail of the year seems to be the Hugo, a blend of gin, prosecco and elderflower cordial with tonic or soda water. You can also order a Black Hugo (reddish, really), with forest fruits. There are also some excessively sweet after-dinner drinks, such as moscato. It is worth stressing that gelato is both unsalted and lower in fat than ice cream – definitely tasty and healthy, as far as pure indulgence goes. As it happens I’m writing this in Georgia, where the food is also wonderful for vegetarians (there’ll be a dish of meat, but it’s just set down on the table surrounded by wonderful salads and other vegetable dishes, and you just pick and choose what you want) – and most of the food is not particularly salty, apart from the cheese, which is … hard work. Italian friends want me to mention that there’s been a craft beer revolution since the 1990s, but… no, I don’t think so. There are a few interesting breweries, some working closely with artisan food producers in the spirit of the Slow Food movement (see the Unionbirrai website), but basically beer remains something to be drunk with pizza, and Italian custom doesn’t really allow it to break out of that straightjacket. Having said that, it’s not just industrial yellow beer – acceptable red beers such as Moretti Rosso are widely available.